Tip #8 - Coaching - Be a coach to your fellow riders. Joe B pulled me aside one day and said that it was time to learn to back roll. I was very hesitant and almost said no, but he insisted. Two hours later I was hitting them fairly consistently. Wow - Joe spent an hour with me and amped me up for days - Thanks Joe! 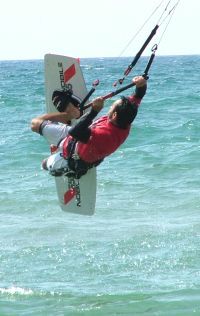 I have been kiteboarding for about 5 years now and it is truly the most amazing thing I have ever done. On a good week when I ride 3 or 4 times I feel like I am on permanent vacation, even while working 40-plus hours. 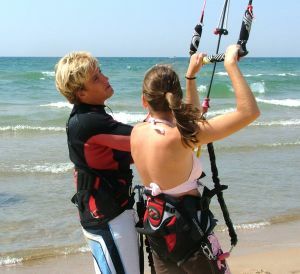 One of the best things about kiteboarding is that there is always something new to learn. It will never end. The other great thing about riding is that there is almost always someone better than you who can help your riding skills. This tip goes out to everyone who can ride upwind and has been through the learning curve of some basic things. A while back MACkite offered to pay $25 for tips and 3 or 4 people sent me the "I don't know enough to give anyone a tip" routine. Quite frankly, most guys who are riding upwind and just starting to jump are full of great tips. The lessons, pains and struggles are fresh in their minds. They watched that video segment 14 times to make sure they got that foot in the right place or kite positioned correctly. That first day of ending up at the same spot on the beach where they started still makes them grin. So you are asking yourself - where is Steve going with all this? Well, this is where I am going: If you can ride upwind, jump, nail 360's or can land Slim Chances almost every time, you have something to share with others. PLEASE spend a few minutes of your down time at the beach coaching others. I'm grateful for all the times the local crew has helped me and pushed my riding. A simple pointer here and there can do wonders to the average person's riding ability. Give the gift of coaching to your fellow riders. It is truly a gift and you can share it for free!